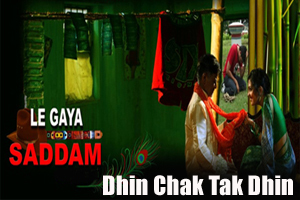 Lyrics Of Dhin Chak Tak Dhin From Movie - Le Gaya Saddam (2012): A Romantic song sung by Roop Kumar Rathod Featuring Raghuveer Yadav and Sufi Sayyad. The Video of this song is available on Youtube at the official Channel Saregama. The Video is of 1 minutes and 34 seconds duration. Lyrics of "Dhin Chak Tak Dhin"
Lyrics in Hindi (Unicode) of "धिन चक तक धिन"